While I was researching different movies filmed in Kankakee County, I also found quite a few actors and actresses that have connections to Kankakee. This post includes actors/actresses who visited, lived, or was born here, and also famous shows that have been performed in Kankakee County. Buffalo Bill brought his show for two performances in Kankakee on July 29, 1909. Although he did not bring Annie Oakley or Sitting Bull, Buffalo Bill brought more than 100 Indians and with other characters. They re-enacted a stagecoach attack as their main act. Duncan, famous for movies such as The Green Mile and nominated for an Academy Award, played basketball on the Kankakee Community College team. After his death, CBS wrote an article featuring Denny Lehnus, the KCC basketball coach, about Michael Clarke Duncan and his impact on the team. According to the interview, Duncan kept in touch with the coach and wanted to come back to Kankakee to start a mentoring program for students. This executive producer was born in Kankakee in 1923 and grew up in Manteno. Erickson joined Paramount Studios in 1944 and worked his way up to be executive producer. Some notable achievements include working with Alfred Hitchcock on Rear Window, Vertigo, To Catch a Thief, and others Hitchcock films. Erickson also worked on Blade Runner, Urban Cowboy, Chinatown, and Groundhog Day, as well as others. Janet Hubert graduated from Momence High School in 1974. She is probably most famously known for playing Vivian Banks on The Fresh Prince of Bel-Air, at least from 1990-1993 (Seasons 1-3). She also has starred in small television roles. MacMurray was born in Kankakee on August 30, 1908. He and his family moved to Wisconsin when MacMurray was 5 years old. He is best known for playing Steve Douglas in My Three Sons. He also starred in Double Indemnity and The Apartment with Shirley MacLaine and Jack Lemmon. Andrew McBroom, who later changed his name to David Bruce, was born in Kankakee in 1916. He attended Northwestern, as did Phylis Isley/Jennifer Jones. He is known for starring in Sergeant York, The Sea Hawk, The Mad Ghoul, and more. McCambridge did not live in Kankakee, but she would come with her parents to visit. Her parents really loved to visit the town and visited quite often. She became famous for being a regular on the radio show I Love a Mystery. McCambridge won an Academy Award for Best Supporting Actress and Golden Globe for All the Kings Men and nominated for an Academy Award for Giant, starring James Dean. She also had small roles on television shows including Bonanza, Charlie’s Angels, and Cagney and Lacey. Mercedes McCambridge is also known for A Farewell to Arms and playing the voice of a demon in The Exorcist. Extra fact: This same song/lyric is also sung by Kermit the Frog on an episode of The Muppet Show. Kankakee may not become the next Hollywood anytime soon, but it does have some Academy Award winners and other famous actors that have come from here. Kankakee first got its name from a Native American word “teeyaahkiki”, meaning open country or exposed land. The Potawatami lived in the area until 1833, then they signed a treaty with the government to move west. Kankakee is not famous for their contribution to film. I remember hearing a rumor that Tom Hanks was coming to Momence to film a movie when I was about 6 or 7. At the time I did not know who Tom Hanks was, so I didn’t know why people cared. There have actually been quite a few movies filmed in the Kankakee area, and a couple episodes of television, too! Almost all of these are only partly filmed in Kankakee, but it is still pretty cool that Kankakee has a small presence, but a presence nonetheless, on the big screen. This Steve McQueen film followed a bounty hunter, Ralph “Papa” Thorson. Quite a few scenes were filmed in Kankakee County, including Bonfield, Herscher, Kankakee, and Manteno. Some specific scenes filmed include a payphone scene in Bonfield, the capture of Tommy Price in Herscher, and a car chase through Manteno. The bus station interior was filmed at the Wilmington bus station. John Hughes wanted the train station to be filmed in Kankakee. Part of the crew waited in Kankakee for a week, but the weather did not get cold enough to snow. Instead, the scenes were shot in an abandoned warehouse. A portion of this horror movie was filmed at the Shapiro Developmental Center on January 28 and 29, 1988. The Shapiro Developmental Center used to be the Kankakee State Hospital, and before that the Illinois Eastern Hospital for the Insane. Tom Hanks and Paul Newman filmed parts of this movie in Kankakee and Will Counties, specifically in Momence. Most of the bank-robbing scenes, as well as a couple others, were filmed here. A scene from Road to Perdition filmed in Momence. Johnny Depp starred in this gangster film about John Dillinger, a bank robber. The movie was partly filmed in St. Anne in 2008, including scenes with Johnny Depp. Gary Oldman starred in this horror movie, which also included scenes from the Shapiro Developmental Center. A scene from The Unborn filmed in Kankakee. Tom Cruise and Cameron Diaz starred in this 2010 movie, partially filmed in Kankakee. This horror movie sequel was partly filmed in Kankakee, Grant Park, and St. Anne. The Daily Journal had an article asking for extras to take part in the movie. The Manteno State Hospital was featured on 3 episodes of Mission Terror. The crew only spent 47 minutes inside before running out. Two years later, another episode was filmed to see if the crew could last more than 47 minutes.They lasted just over an hour, and came back in 2015 to try and stay even longer. A Momence man was filmed in 2002 due to his James Bond Collection. The episode, called “James Bond Gadgets” was aired on December 2, 2002. His collection includes over 6,000 items and includes a Q-Boat, a minisub, and a chase boat from the James Bond movies. As you can see, Kankakee County does have a little bit of film history, even if it does include mostly gangster or horror movies. On March 4, 1881, Kankakee became the 16th city in Illinois to be given a telephone license. 48 telephones were installed in the first year, and by April 1882 a 12-mile telephone toll line connected Kankakee, Grant Park, Exline, Chebanse, Irwin, Herscher, and Cabery. Feel free to leave comments and/or questions! I’d love to know what you think of the posts, the blog, or anything you would like to see in future posts! For this post, I thought I would share a little bit about what I do during my time at the museum. Although every day is different (which is one of my favorite things about it! ), I have been working on a few big projects. I try to be here most days either from 10-4 or 1-4 on the days I work at my other job at Olivet’s library. My day usually starts with a cup of coffee. I live about a half hour away from the museum and I always have to bring my coffee thermos with me. 🙂 Once I get to the museum, I check in with most of the staff and get a feel for what the day may bring or if there are some big projects to work on. If there is, I get right to work on those. I have been working with a couple different staff members, so projects vary. I may be working through the archive rooms or working in our photo room. For a couple of days, I organized and viewed slides for projection shows. They were fun to go through, and there were a lot of random places! There were quite a few of Kankakee County, with buildings and places that I recognized instantly, but a lot were from all over the world. I saw slides from Europe, Australia, and all over the United States. You could travel around the world from Kankakee! If there is not any big project that I am working on, I work in the office in the back working on a couple of different things. Lately, I have been working on the blog, usually researching, writing, and proofreading. I have not really blogged before, but I am really enjoying it and getting the hang of it more every time. I have also been working on some virtual exhibits found on the website. (Check them out here!) These virtual exhibits are shortened histories of different topics. Right now, the website has 3: Myers Bakery, Kankakee’s First Courthouse, and Music of the Civil War. If I have extra time, I work on researching different topics. Hopefully some will be up soon and you can read them! I usually end my day by stopping at Dunkin’ Donuts. 4:00 is right in the middle of happy hour, and it is on my way home, so it’s hard for me to pass up! No day is ever the same (well, maybe except the coffee), but as I said earlier, it is one of my favorite things about the museum. Every day is unique and that makes it all the more interesting. When the famed Hotel Riverview in Kankakee burned down in 1897, there were no fatalities of the 40 guests/tenants and 25 staff members. R.D. Goodwin, a railroad clerk, had the only injury. He slept through the fire alarms and awoke to find he could not get out of his room due to the smoke and flames. He barged into the next room but still could not get out. Goodwin started throwing mattresses out of the window. He jumped out and rebounded off the mattresses onto the stone foundation. He was taken to the hospital, but only had a little bruising on his back and shoulders. The remains of the Hotel Riverview in 1897. When 2016 came we knew it would for sure bring two things: An extra day in February and a presidential election. We see enough comments about the election coming up, so I am not going to say too much on that subject. However, since we just celebrated the 4th of July and the election is coming up soon, I decided to use this blog to talk about the different presidents that have visited Kankakee County (it’s more than you think!). I am going to include those who visited either before or after they became president, but not those who were running for President but lost. William McKinley: McKinley was president from 1898-1901. He visited Kankakee twice, once on November 1, 1894 while he was campaigning for governor of Ohio and on October 15, 1898 while he was president. During his 1898 visit, he arrived at the Illinois Central station at 8 pm on Saturday. There were about 5,000 people in attendance for the non-partisan event. McKinley gave a speech about his earlier visit, Illinois’ role in the Civil War, and the Lincoln-Douglas debates. His speech was cut off short; the train started rolling away while he was still talking. After his assassination in 1901, Kankakee held a memorial service on the courthouse lawn with 5,000 attendees. Teddy Roosevelt: Although there is not a definitive time or mention when Teddy Roosevelt was in Kankakee County, he was known for hunting along the Kankakee River. He, along with Grover Cleveland, would hunt at the White House Hunting Club, located in Lake County, Indiana. However, there have been rumors that Roosevelt went further down the river into Kankakee County. William Taft: Taft was known to go boating on the Kankakee River. Taft won Kankakee County’s votes both times he ran, although he only won the presidency for the first term. Warren Harding: Harding campaigned in Kankakee in 1920. He would later win both the county and the country. Dwight D. Eisenhower: Eisenhower visited Kankakee County in 1962 on a parade route. About 25,000 people stood along 10 miles of the route to see him. Richard Nixon: Nixon visited Kankakee County in 1956 while he was vice-president to Dwight D. Eisenhower. Gerald Ford: Ford became the last sitting president to visit Kankakee County. He would win the county, but not the election. Ronald Reagan: Reagan visited both Kankakee County and Will County in 1976 while campaigning for the Republican nomination against Gerald Ford. Reagan spoke to 600 people at a breakfast speech at the Holiday Inn in Bradley on February 13, 1976. He spoke about gun control measures, said that Illinois “holds the world record” for professional welfarists, promised a balanced budget and said he’d stop inflation. Overall, his speech had 13 interruptions of applause. Reagan later lost the Illinois votes and the nomination to Ford. Barack Obama: Obama also visited Kankakee County twice. In September 2004, Obama visited Morning Star Baptist Church. On February 18, 2005, while a senator, Obama gave a speech at the Hilton Garden Inn. He gave a pro-business speech in which he contrasted the departure of Maytag with Google. He also talked about improving businesses by bettering our schools, asking for more federal money for roads, and supporting the Peotone Airport. Later the same day, Obama spoke at Kankakee Community College about minimum wage. For those of you not keeping track, that is 9 out of 44 presidents who have been to Kankakee County. That’s 20%! At that rate, we may have a few more visiting soon.Who knows, a future president may have been here already! The Kankakee County Courthouse architect has been known to be Zachary Taylor Davis, pictured to the right. His wife was from Momence, giving him a special interest in the project. Davis and his firm also designed Comiskey Park and Weeghman Park, today known as Wrigley Field. Even though I have lived in Kankakee County for most of my life, I was not familiar with the museum until the past year or so. The first time I walked through the museum was the day of my interview, and I was overwhelmed with how nice everything was! I never realized how much history is found in Kankakee County, and every day I find out countless more facts about Kankakee’s rich history. all of you about my favorite museum exhibit: The Story of Kankakee County. This is one of the newest exhibits: it opened this past May. This exhibit gives insight to early Kankakee County, especially Kankakee in particular. In it, you can see anything from a blacksmith’s bellow to a model of the Hotel Riverview to old medical supplies from Riverside Hospital. There is so much information, and countless pictures to complement the exhibits. I have spent a bit of time wandering through this room, and I still think I missed some of it. This is my favorite exhibit because, for one, I really enjoy how open the room is. It is spacious, but still full of information. Everywhere you look, there is something to catch your eye, but it is not overly busy either. I love how much there is to this exhibit. This exhibit really gives you a sense of what life was like back before most of our modern advancements were here. As I said earlier, I have lived in Kankakee County for most of my life so there is some familiarity to the exhibits. This only enhances the exhibits, because I think it is much more interesting to know exactly where, say, the Hotel Riverview was located. I never knew it existed, but I could picture where the location is today. If you stop in the museum soon, be sure to check out this exhibit. Even if you are not from the county, there is so much information and cool things to see. I’m sure you would enjoy it! You Learn Something Every Day: After the plans for a third courthouse (the one we know today) were completed, the second courthouse needed to be knocked down in 1908. Otha Grubbs, a struggling carpenter, promised $2 to dispose of the building and site within 2 months, while most contractors wanted the county to pay them. The county agreed to Grubbs, who sold the stone, timbers, steel, etc. He made over $2,000 and kept enough materials for his own business and several houses. The Second Courthouse, demolished in 1908. Before I start this blog, I just want to take a second to introduce myself. My name is Sadie Witvoet, and I live in Grant Park. I will be a senior at Olivet Nazarene University this upcoming fall, and I’m studying Business Administration and Marketing. 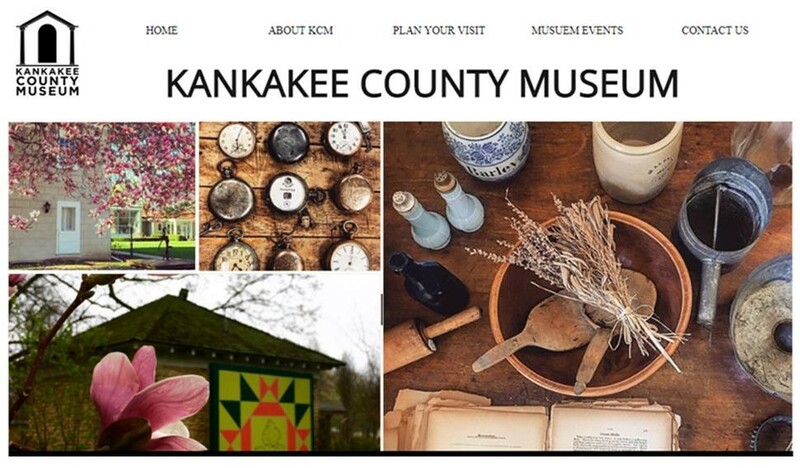 I was so excited to start an internship here at the Kankakee County Museum. The staff here is awesome, and being here doesn’t even feel like work! I’m very fortunate to be able to have this opportunity, and I would love to share some of my experiences with all of you. Although our blog has been out of commission for a little while, we’ve been discussing bringing it back and thought it would be interesting to have an intern’s point of view. I’m very excited to start this, and I hope I can provide a fun and intriguing insight into what goes on at the museum for all of you. I am going to end each blog with a little fact that I discovered during my day or week at the museum, either from walking through the museum or from my research. I hope you enjoy them! You Learn Something Every Day: On October 21, 1931, Paramount Theater hosted the wedding of Artis Weaver and Adelene Winterroth to promote the movie “I Loved a Woman”. To show their appreciation, the theater gave the newlyweds a sack of potatoes, a half ton of coal, and more. 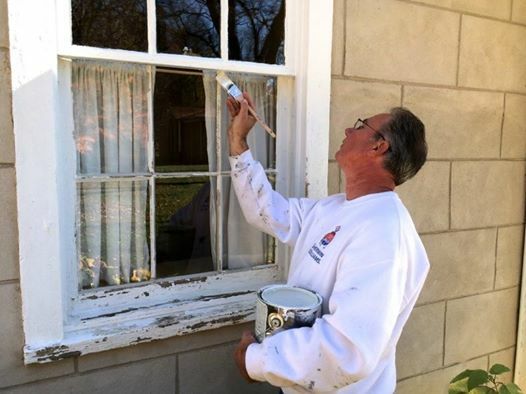 Our beautiful Dr. Small home is being lovingly cleaned and treated this week. Check it out for yourself! It looks brand new, despite being 159 years old!